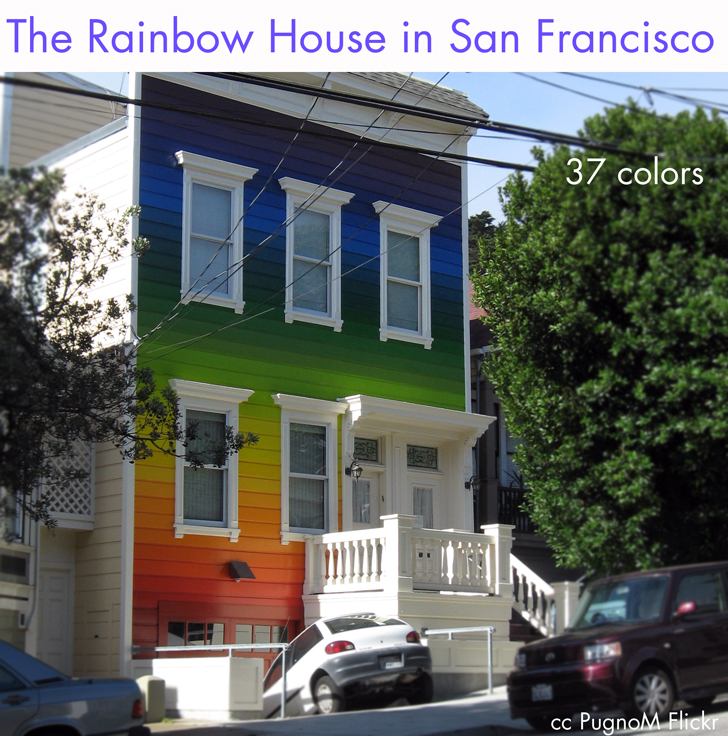 This is the rainbow painted house on Clipper Street in San Francisco. The Front Facade is painted in 36 different siding paint colors and one trim color on window & doors casings, trim, and fascia. The siding hues are very strong and vibrant and the off white trim color frames the color scheme perfectly; in the color spectrum all the colors together equal white so on this home the balancing color element is the trim. Notice in the picture by photographer PJ Taylor where from street level looking up- the white soffit protrudes nearly 4 feet from the building; this architectural feature is a colorist dream because it can be used to frame a dark or intense body color. 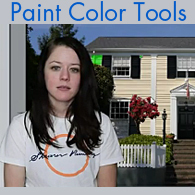 The home is more of color study assignment in a paint theory class than a typical color scheme that would be selected by a home owner; however the achievement in terms of color balance can easily be recognized by any colorist. The Facade has 38 rows of clapboard siding; no paint color system exists that has colors that would exactly match the colors selected on this home. The majority of these paint colors were custom mixed by design to suit an exact value, hue, and intensity. An experienced painting contractor would also recognize that many these colors are deep tone and clear base requiring more time and additional coats of paint for coverage compared to most normal paints. 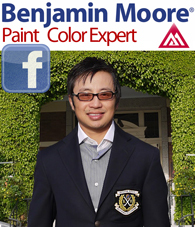 I have selected two Benjamin Moore Colors AF-10 Gardenia (Affinity color) and CSP-305 Crisp linen (Color Stories). soffit on the first level of the house.